When you are in the market for a new lift chair, deciding whether to look for a local brick and mortar lift chair store or an online reseller can be an important decision. For most, both options offer some advantages and disadvantages, however for the cost conscious, an online lift chair store, even after shipping costs, will almost always offer the best deals! If you are familiar with online purchases, you have most likely heard of Amazon and how they have gone to great lengths to disrupt local stores, like Best Buy. They have gone so far as to promote smart phone applications that allows people to price check merchants in real time, so the consumer can get the best deal. While the home medical industry is nowhere near as advanced, the fight between traditional lift recliner merchants and online lift chair stores is quite similar. And, it is often possible to instantly price check a traditional medical supply store, by visiting online merchants. While from strictly a cost perspective, it is hard to beat an online lift chair reseller, as their operating costs are typically lower, the one thing they lack is a physical show room. Since for most seniors, buying a new lift chair is a big purchase, being able to try out different options and see how they work before actually purchasing them is a big selling point. As a result, a brick and mortar medical supply store, which will almost always offer a lift recliner show-room, can be a great place to start the shopping process. Another factor that a local lift recliner store has going for it is that in some cases, although this largely depends on the size and sales volume of the store, it is possible to purchase the lift recliner right away. While shipping times are usually very low to begin with, being able to go from sitting in a lift recliner to taking it home is a nice selling point. However, depending on what lift recliner the senior is shopping for and the options required, this is not always possible, even with a local medical supply store. Free setup and local support is also, in certain cases, available and easier to obtain when doing business with a local merchant, so this can be a concern as well. One of the biggest advantages of buying a lift chair online is the cost! 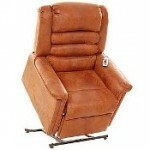 It is almost always possible to get a better deal when buying online than it is from a local lift recliner store. In part, the lower cost is due to a different sort of operating cost, as online lift chair stores are almost always just drop-shipping the chair from popular lift chair manufacturers, like Golden Technologies. As a result, they are paying salesman and people to work on their website, rather than having to deal with the costs of running a traditional business. Having said that, don’t be afraid to negotiate! You can always ask if the local seller will be able to match online prices or if they offer any added value! Another advantage of using an online lift chair store is that the selection offered is almost always much greater than what you can see at a local lift chair showroom. Of course, both have access to the same products and lift recliners, but a lift chair website will typically offer an easier way to browse online lift chairs, sometimes even offering lift chair reviews. Whether one type of lift recliner store is better is largely a subjective choice and, as shown above, they both have advantages. Just like some people goto Best Buy to check out a product, only to buy it cheaper online, some folks also do this with lift chairs. Although, the morality of this is up for debate, the fact remains that as a consumer, getting the best deal is important.